Located several kilometres off the West End of Rottnest this is one of Rottnest Island's premier dive sites! Grey Nurse Sharks periodically use the cave to rest during the day so the chance is high for a close up encounter! Large, adult Grey Nurse Sharks use the Shark Cave for shelter during the day before they head out at night to hunt. The cave opens up at about 15 metres and goes down to 26 metres at the back of the cave. 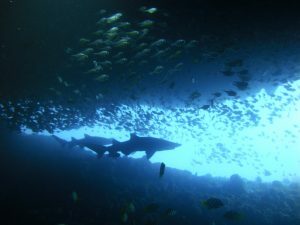 The cave looks like a big overhang with the silhouettes of Grey Nurse sharks make great photos! The sharks are not guaranteed and they are also very skittish/shy. As long as you are still and not swimming towards them you can a great encounter. After the cave you can spend some time looking for nudibranchs and reef fish around the site. WHERE: We meet at Molfetta Quay Jetty, Fremantle at 7:45am sharp. By 8:00 we will be cruising over to the Opera House. Usually do 1 dive on The Shark Cave and the 2nd dive around West End or Swirl Reef, depending on conditions. Back by approximately 16:00, hopefully before the sea-breeze comes in. FORMAT: Approximately 1 hour boat trip to dive site for first dive, with a 90 minute surface interval whilst moving to 2nd site. All dives must be done within no decompression limits. Staff will be monitoring computers. Nitrox is also available for those with Enriched Air certification but must be organised at least a day or two before the charter. Scuba Gear and one tank. Bookings can be made via the shop on 9240 6662 or pop in for a chat! Payment in Full required on booking. Non refundable if cancelled within 48 hours of Charter. Minimum numbers are required for charter to run. Diving Frontiers reserves the right to cancel or defer charter if minimum numbers are not met. Dive charters are dependant of weather conditions and Diving Frontiers reserve the right to cancel or change boat/dive site if we believe there is a safety risk to passengers or crew. Divers “MUST” present there Dive Certification or Temporary Dive Card on the morning of the charter to be permitted to board the vessel.